In my youth, we had bird feeders, and I have found there are two types of families: Those that allow whatever to come and feed and those that fight the squirrels. Adam’s family has perfected the art of how to squirrel proof a bird feeder. While mine comes from the live and let live bird feeder camp. 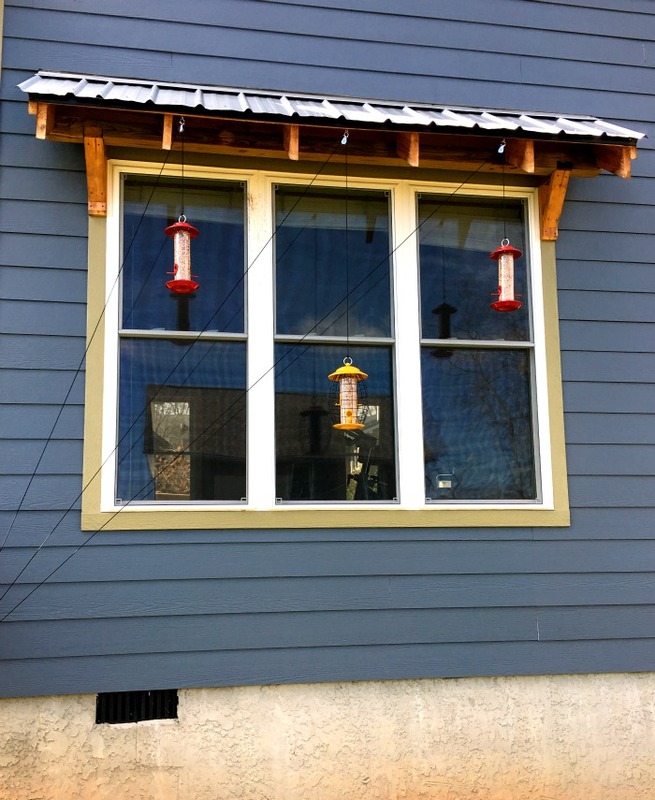 Adam wanted to hang bird feeders, I thought it was unfair since we have out door cats. Lazy outdoor cats but small furry predators none-the-less. Oddly enough Adam’s family squirrel fighting secret also makes the feeders cat proof. Here are the tips he taught me! Bird Feeders*: Bonus points if you pick colorful feeders. They will add some color in the winter months when all the flowers are gone. The secret is a set of pulleys. This allows you to hang your bird feeders high, while, allowing for you to easily lower them for refill. Take your hooks and push them into the wood. Then hang a pulley from the hook. You can see the pulleys below. The next step is not hard but certainly annoying. You’ll have to run your line through the pulley, tie it to your bird feeder (leave it empty!!! ), and then figure out the height you need to be able to lower it to a level where it is low enough to fill but keep your rope from being so long it drags all over the yard. In our case we wanted three hung, so we had the added bonus of trying to get them the correct matching heights. I’m pretty sure we never resorted to yelling, but there was at least one huff had in the process. “Up an inch. No too high. Down a little. No that’s too low.” That is a lot to deal with, while 4 kids run about like crazy fiends and someone else stands outside, on a 12 foot ladder, in 20 degree weather trying to gauge height. You will need another hook to loop the ropes over at the bottom. We chose one hook because we liked the way the lines looked pulled to one side and they double as perches for the birds. You could easily add a hook under each feeder and take the line straight down if you wanted the rope to be less noticeable. Once all heights have been decided you will want to firmly tie a loop in two places on the rope. One for where it will hang everyday and one at the end of the rope. 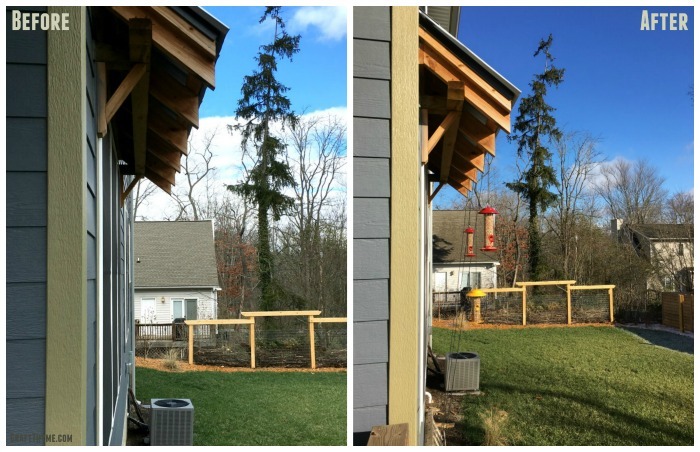 The one at the bottom of the rope will allow a single person to lower the bird feeders and fill them without needing to take them off the pulleys. 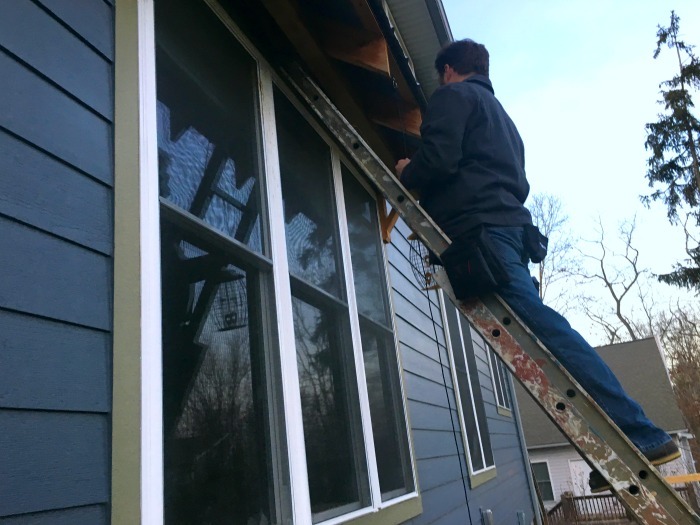 When we were completely satisfied with the two heights (which necessitated a second trip to Lowes for more rope) we took a lighter and lightly singed the ends of the rope and knots. This will keep them from unravelling and coming untied. BE VERY CAREFUL. Fire and melty nylon is no fun. Getting sued because a reader melted a rope to their finger is even less fun. You have been warned. You can skip this step and everything will be just fine. I love the added pops of color the feeders add in the winter. First, for everyone who can not see the obvious, birds fly; cats and squirrels do not. The high level keeps the birds safe from the cats. If a squirrel decides to try to run up the ropes they are too heavy for the bird feeder and end up moving it around on the pulley. The instability makes the squirrel jump off. So far it has worked like a charm. The kids love seeing the birds from inside the house. I have to grudgingly admit I am also impressed. We have some smart squirrels who have chewed through other ropes and twines. Any other rope/twine/cable suggestions? Right now I have fishing line up but they’ll eventually chew through. Hi- I tried something similar to this a few years ago. By the 2nd day, the squirrels had chewed through the nylon rope, thus dumping the full feeders for an instant ground-covering banquet. The next solution was to try steel cable, although they can indeed run up it easily. The best fix? My pit bull (a shelter rescue) loves to chase the squirrels away, then patrols to make sure they don’t come back. Lets her burn off energy, and chase squirrels up our trees. I am going to say you have some super squirrels. Ours must just be lazy.